Your dog's barking has become a terrible behavior which directly affects you and your neighbors but you don't want to hurt them. Thus, you will need MARDOG no bark collar. The collar will start teaching your dog immediately, right after you put it on your canine's neck. The progressive sound and vibration will create an unpleasant correction whenever he/she starts barking. Soon, your dog will understand that in order to avoid the correction, he/she needs to stop barking. You don't have to keep it on your dog 24/7, only when needed. 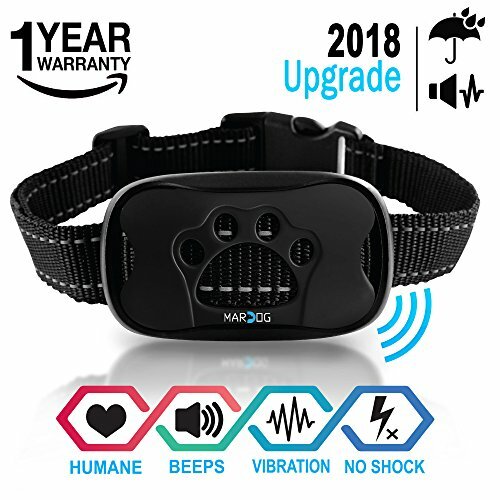 *TIPS FOR USE: To get the best results of MARDOG no bark collar, we recommend customers to make the most suitable adjustment for dogs, not too tight or too loose, spare 1-2 inches for your canine friend to grow. Moreover, check the battery weekly and take notice if the dog keeps barking. It is maybe due to thieves, dangers or natural disasters. HARMLESS, HUMANE, QUICK RESULT: The bark collar is designed to continuously use vibration and beeping sounds whenever you dogs bark. Soon, your canine friend will be taught that only by stopping barking, he/she can get rid of annoying vibration and sound. FIT ALL SIZES: No matter if your canine friend is a small Chihuahua or even a great Alaskan Malamute, the no bark control collar is effective for all sizes from 11 lbs up to 150 lbs. Easily to adjust and very light, your dog will hardly notice the collar. NEW INTELLIGENT CHIP AND UPGRADE 2018: New advanced technology in smart sensor is applied to MARDOG . With the new sensor, the anti bark collar can only be triggered by your dog's sound, which will not be affected by another dogs or human noise. WATERPROOF DESIGN: Using the latest technology, Mardog no bark collar allows your furry friend to play in splash water, rain or even in snow. SATISFACTION GUARANTY: Within 60 days of use, if there are any inconvenience and you don't love our MARDOG collar, your money will be fully transferred back to you. If you have any questions about this product by MARDOG, contact us by completing and submitting the form below. If you are looking for a specif part number, please include it with your message.